Offering you a complete choice of products which include micron hobs & serration cutters and h.s.s. gear hob cutters. We manufacture and export these H.S.S (High speed steel) M2 & M35 Micron Hobs & Serration Cutters. We use premium quality of raw materials in manufacturing these cutters. These cutters are used in machine relieved and ground relieved with high speed. 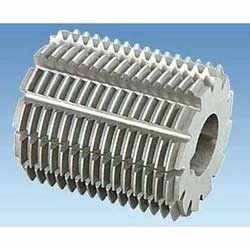 We manufacture these cutters in multiple number as per the requirements of the customers. We offer this with the latest technology by using first grade quality material. Our collections of these cutters are well known for its dimensional features, designs, and resistance nature. These products are available in various sizes at competitive rates. Micron Hobs & Serration Cutters Sizes : 3 Module with ground Finish, Serration Cutters Also manufactured to any pitch & include angle With Ground Finish . We manufacture a wide range of H.S.S (High speed steel). M2 & M35 Machine Ground Relieved Gear Hob Cutters that is produced using high grade raw material. These Machines are available with in various sizes and specification as per the client's needs. The offered products are widely demanded in the market owing to its optimum performance and easy operation. These are reliable and are highly durable with longer functional life. We also provide customized solutions of these Machines and are available for market price to the clients. Gear Hob Cutters Sizes: From 1 Module to 24 Module, 50 DP to 1 DP Also Chain Sprocket Hob as per drawings.